This post is also here. 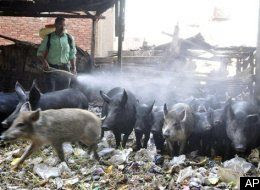 All 300,000 pigs in Egypt are in the process of being slaughtered today—an awfully peculiar strategy for preventing swine flu. Apart from the sheer irrationality of it all, it makes you think about killing animals. Is each and every pig being wronged—to be precise, having its (his, her) interest in going on living violated? Do animals have an interest in going on living? I write about this in my forthcoming book, but there’s never time to read everything, and now that I’m done, I’m doing some remedial reading—to wit, I’m reading Jeff McMahan’s very thick and detailed book The Ethics of Killing. I’m only part way through, so can’t say yet how the story is going to turn out, but here are some gleanings from part one. The interest in going on living that you have at a particular point in your life (your “time relative interest” in going on living) depends—says McMahan—on the “prudential unity relations” between you at that time of your life and you* or you** at later times. He says it’s a question of degree—the more continuities (of the right sort) between you and you* (etc) the stronger your interest in going on living. But animals, he says, are connected to their later selves by only a fraction of these required continuities. The continuities that make you (now) have a stake in the welfare of you* (later) are all “mental," says McMahan. You have certain beliefs, and they persist in you*. You have certain desires about your future, and they get satisfied by you*. You are searching for something, and you* completes the search. The more continuities there would have been between you, you*, you** etc., the worse it is for you if something bad happens, and you die before you get to be you* or you**. The argument about animals, then, is that their past and future selves are united more loosely; there are fewer of these continuities. So they have a weaker stake in going on living. The convert. If you lose your religion, going from belief to disbelief, or the other way around, then there’s less continuity between your present self and your future selves. The Buddhist. You’ve taken heed of Buddhist wisdom that desire is the root of all suffering, so you “live in the present” and limit your desires about the future as much as possible. Again, this is going to make for weaker "prudential unity relations." The "flow"er (to use the language of the psychologist Mihalyi Csikszentmihalyi). This is someone who frequently loses herself in intense activity, losing awareness of the past and the future. Bear in mind--this is supposed to be a desirable psychological state. Once again, this person's past and future selves are going to more weakly united, compared to a person who constantly obsesses about the future. It would be awfully odd to think these three types of people had a weaker stake in going on living, considering that there's nothing undesirable about the states of mind they're in (perhaps just the opposite). Should we really take it on board that mental continuities are the basis for having a stake in going on living? A few footnotes: (1) There’s a lot of hairy stuff in this book about identity. For you (now) to have an interest in the welfare of you* (later), must you (now) be identical to you* (later)? Let’s ignore that question. I’m not taking a stand on it by multiplying names (“you”, “you*” etc.) ike this—they’re just a convenient shorthand. (2) Don't jump to the conclusion that McMahan thinks it's not so bad to kill these three types of people. The issue (so far) is just about the level of their interest in going on living, not about the ethics of killing them. (3) McMahan does have things to say about some of these cases--pages 81-82--but in the interest of spurring discussion, I'm not revealing his "solution."